Hello gorgeous! How has your week been going? Mine is going well, considering Monday was my Friday and I am currently vacationing in California! I am so glad you stopped by the blog today because today I am giving you 5 wardrobe hacks every girl needs to know! I know you have been there… you go to put on your favorite sweater, and immediately put it away because of the awful peeling. Or you put on your go-to jeans and can’t help but notice how they have lost their shape/color! It is totally no fun. Let’s get started! I know, I know… this may sound really gross to some people. I really try to refrain from washing my blue jeans as much as possible. The more you wash your jeans, the sooner they loose shape and have faded color. If I get something on them, I just try and spot clean and I push off washing them until I absolutely have to. If your jeans are starting to smell, put them in a gallon ziploc bag and stick them in the freezer overnight. In the morning the stench will be gone. I have a pair of jeans that I wear when I know I will be getting dirty and they will need wash. I save all of my nice jeans for just regular daily activities. If you don’t believe me, the CEO of Levis explained why you shouldn’t wash your jeans here. I always HATED when I would put on deodorant, put my shirt on, then end up with a huge deodorant stain on my dark shirt! Those suckers are tough too! No matter what you do they just do not want to come off. Using a dryer sheet takes these babies right off like they were never there. This honestly works like a charm! I usually do my makeup before I get dressed, so when I am pulling my shirt over my head sometimes my makeup gets on it too… and it’s devastating! :( Luckily there is an easy fix! Just apply some shaving cream to the stained area, scrub a little, and the makeup is gone! I am a huge online shopper, so a lot of times I just order my regular size in shoes and hope they fit. Most of the time they do, but sometimes they are just a little too snug! The first time this happened to me I was so sad because I loved the pair of shoes and they had no other sizes left. I was determined to make them fit, so I started to do some research. I read that if you wore a thick pair of socks, put the shoes on and then start blow drying, they will stretch! I was amazed that this actually worked! Now, whenever I have shoes that are just a bit too small, I just use this hack and the problem is solved! Peeling sweaters are just no fun. It is so frustrating to have the little fuzz everywhere and I feel like it makes the sweater look cheap… even if it’s not! Whenever my sweaters start to peel, I use a clean razor and lightly run it over the fabric. It removes almost all of the fuzz and it doesn’t ruin the sweater either! Win! Whenever I venture out and buy jeans from a different brand, they usually have a big gap at the waist. For the longest time I had jeans that I would constantly have to pull up all day long. I got so frustrated with doing this, so I had my sister sew a piece of elastic at the waist of my jeans that had this issue, and then they fit! I hope you enjoyed today’s post and are able to use a few of these tips! What are some wardrobe hacks that you use? I would love to hear them! Love this list babe!! You are such a boss!! This top is STUNNING, love the jeans and the tan accents are perfection!!! I always use the dryer sheet trick! These are such great tips!! I will have to remember the shaving cream one! Fabulous! 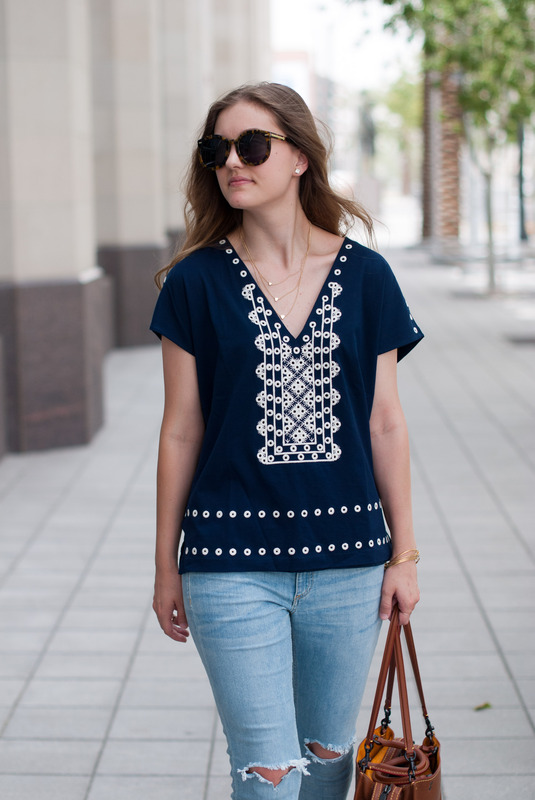 I tried the blowdryer trick on my Tory Burch flats and it actually worked!!! I was so surprised and happy!!!! I will definitely be trying out all of the others! This was so fun to read! Love these hacks! You nailed it. Thanks so much for sharing! Such great life hacks! love your shirt and shoes too! I definitely need to try out the hair dryer and socks trick! That will totally come in handy for me! These are great tips! I haven’t heard of so many of them. Definitely will be needing to use the shaving cream ALL the time:) SO helpful! Oh my goodness, I LOVE this post and your tips… they are fantastic! I have tried the socks with shoes thing, but I never thought about blow drying them! Seriously ALL of your hacks are so helpful! Great post Hales! Okay, so the deodorant and makeup tricks are AMAZING!! I am so trying both since I tend to do both of those often. You look beautiful. 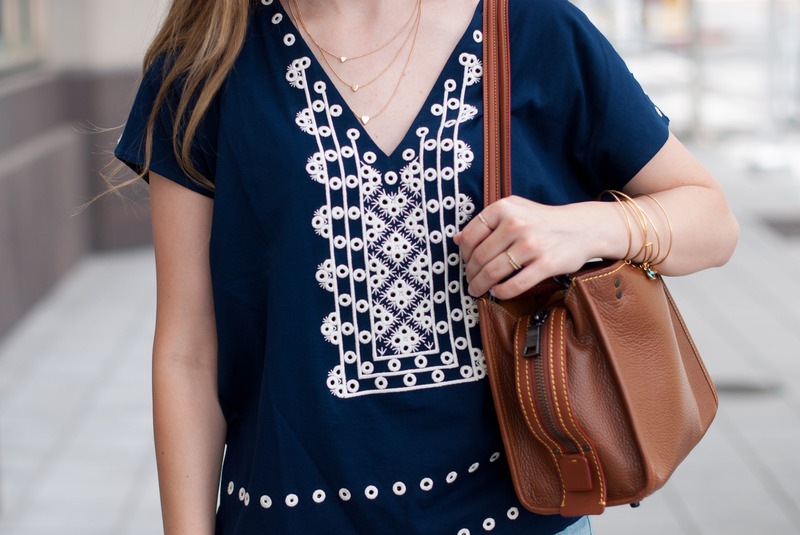 Love the embroidered top. Such great tips! I’ll have to remember some of these! So many good tips – love this post! Your top is also super cute! !